The Primiero: a Beautiful Valley Surrounded by Forests and Majestic Dolomites. The Primiero (Primör in German) is a valley situated in eastern Trentino. It is constituted of six municipalities: Fiera di Primiero, Imèr, Mezzano, Siròr, Tonadico and Transacqua. This small sub-region, partly located in the middle and upper valle del Cismón (Cismón valley), is a community which gathers – besides the main municipalities listed above, which are all located at a close distance – also the two ‘eccentric’ municipalities of Canal San Bovo, situated in the nearby Vanoi valley (a tributary of the Cismón) and Sagron-Mis, a small community beyond Passo Cereda (1,369 m), in the direction of Gosaldo and already part of the Mis basin, tributary of the Piave (most of whose course is in the province of Belluno). The Primiero, as properly intended, is therefore to be identified with the central and upper section of the main axis represented by the Cismón valley, gathering in all about 8,200 inhabitants. 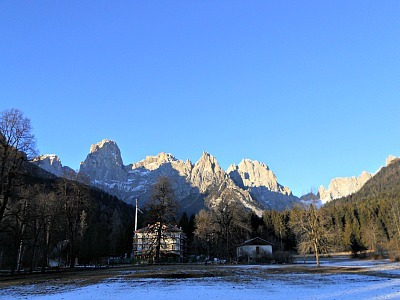 The important resort of San Martino di Castrozza (1,444 m) is also part of the sub-region but not an independent municipality within it; it is situated not far from the important Passo Rolle (1,984 m), in view of the majestic group of the Pale di San Martino (see image above). 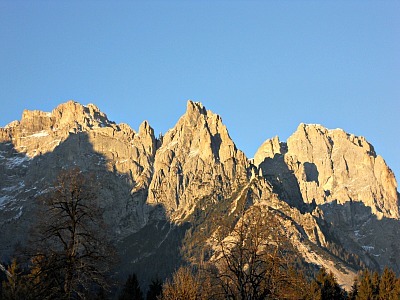 The Primiero valley is situated in eastern Trentino. The main access to the valley is through the Schenèr gorge, which puts in communication the sub-region with Feltre. The Passo Rolle connects instead the area with the Val di Fiemme, while Passo Cereda (1,369 m) connects Primiero with the Agordino; finally, Passo Gobbera (989 m) links the Cismón valley with the nearby Valle del Vanoi (although today communication is generally through the modern tunnel under Monte Totoga) and, through this latter valley, it is also possible to reach the Tesino plateau and the Valsugana. The meadows of Primiero central basin cover the middle section of the Cismón valley, onto which several minor tributaries flow – the main ones being the Canali stream (Val Canali) and the Noana stream (Val Giasinozza and Val Noana). The valley is enclosed in all directions by important mountain groups, belonging to the Dolomites: the Pale di San Martino are to the NE, the Lagorai to the NW and the Vette Feltrine to the S – all of which encircle the central basin like an emerald jewel in a rock casket. The Pale di San Martino present in their interior – enclosed among peaks and pinnacles – a wide plateau of about 50 km², mostly made of Dolomite, and several summits exceed in altitude 3,000 m (as for example the Vezzana, 3,193 m, and the Cimon della Pala, 3,183 m). The group of Lagorai-Cima d'Asta – at the boundary with the Val di Fiemme and the Valsugana – is constituted by magmatic rocks (mostly porphyry) and among its highest peaks are Monte Colbricòn (2,602 m), Cima Cece (2,745 m) and Monte Cauriol (2,495 m; the latter two are already in the Valle del Vanoi). In 1967 the Paneveggio – Pale di San Martino Natural Park was instituted, which includes – as well as portions of the Pale and Lagorai chain – also the meadows, pastures and forests of the Val Canali, Val Venegia and Val Vanoi. The Primiero basin, from a geologic point of view, belongs to the region of the Dolomites, whose territory extends over an area straddling the Linea della Valsugana. The latter is a fault-line of regional importance which begins to the south of Lago di Caldonazzo and reaches as far as Cadore, passing through the aforementioned Passo Gobbera and Passo Cereda, therefore crossing the whole of Primiero with a direction ESE → WNW. This extensive fault digs deep into the Metamorphic Basement of the Southern Alps, and in its correspondence a crustal shortening several kilometers long has formed. The litho-stratigraphic succession displayed by the rocks that are present in the outcrop – or below ground – in the area in question is particularly varied and complex, both for its lithologic and hydro-geologic characteristics. In the area of Primiero, the Valsugana fault-line puts into contact two different litho-structural, extremely different domains: to the north of the fault, a succession of rocks emerges from the Metamorphic Basement of the Southern Alps, dating back to the Early Paleozoic (Ordovician-Silurian-Devonian) and reaching without interruption the Sciliar Dolomite layer from the Upper Ladinian. On the contrary, in the central and eastern section of Primiero are found exclusively crystalline rocks such as the metamorphic outcrop of the Basement, the granitic-plutonic complex of the Cima d'Asta and the ignimbrites of the “Piattaforma Porfirica Atesina”, which constitutes here the Lagorai range, while in the easternmost section – to the east of the Cismòn – is present the typical Triassic sedimentary succession which forms the Pale di San Martino group and is developed within the Werfen Formation (Scitic), here reaching also the Sciliar Dolomite layer. On the contrary, to the south one can find outcrops of the Metamorphic Basement and the Permian porphyric ignimbrites of the Adige valley, but exclusively in the area of Passo Cereda, where in any case these outcrops have a limited surface extension. This, in conjunction with the fact that the succession reaches the Scaglia Rossa of the Upper Cretaceous, gives a purely sedimentary character to the succession, which is reflected also in the behavior and in the mechanical responses that the different rock compositions offer to tectonic stress. In fact, the crystalline rocks and the Dolomite (where these form extended, powerful bodies) gave origin to a classic dominion of fragile deformation, in which fractured structures such as faults prevail (especially those at high angle), while the ductile formations are limited to high-scale folds, such as the anti-clinal of Cima d'Asta, in correspondence of which rises the outcrop of the Metamorphic Basement and the batholith of Cima D'Asta, embedded in the former. On the contrary, where sedimentary, more recent carbonate rocks are present – scarcely or not at all turned into Dolomite – folded structures of different nature prevail, as well as overthrusts. This is what happens for instance in the area to the south of the Valsugana fault-line, in which the anti-clinal of the Vette Feltrine and the overthrust associated with it are the main structures, accompanied by other structures with direction and morphologic characteristics that are more akin to the rocks involved in the “Linea della Valsugana” (Valsugana fault-line) and the “Linea di Belluno” (Belluno fault-line). According to legend, the Primiero basin was originally covered by a wide water expanse, surrounded on all sides by the Pale di San Martino and the Vette Feltrine. In the vast lake fishes lived peacefully with a solitary otter, until one day the otter – tired of her solitude – managed with patience and determination to dig a passage at the bottom of the basin: the water could escape roaring, and down it went, forming the Schenèr canyon (“Gola dello Schenèr”). The otter's noble gesture, which allowed man to become established in the valley, gave the animal the honour of being chosen as symbol of the area, and now it appears as an emblem of Primiero and in the coat of arms of all the municipalities of the valley. The valley was already inhabited by the hunters of the Neolithic, as demonstrated by the site of the small Colbricòn lakes, near Passo Rolle. In the High Middle Ages the Langobards gave Primiero to the city of Feltre; the archaeological digs carried out by the Chiesa Arcipretale in Fiera in 1996 have allowed to discover the traces of an Early Christian church of vast dimensions, dating to the V-VI centuries. At the time, a fairly extensive and well-organized community must have already been established in the valley. For a long time, the history of Primiero was thus linked with that of Feltre, being the valley a ‘dependence’ of the Bishop of that city. In 1273 the Charters were given to the community then living in the valley, and a ‘Consiglio’ formed by the ‘marzoli’ was instituted; that is, the ‘borgomastri’ – 'mayors', so to speak – of the four ‘regole’ (or townships) of Imèr, Mezzano, Tonadico, Transacqua, and the official representing the Bishop, then captain in residence at Castel Pietra. 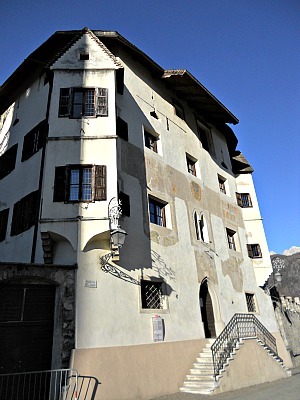 At that time, S. Martino di Castrozza was the old headquarter of the ‘Gastaldo’ – a steward imposed by the Counts of Feltre, and later deposed by the Bishop of Trento. In 1349, Charles I of Luxembourg, Emperor of the Holy Roman Empire, conquered Feltre and Belluno, and erected Primiero as his jurisdiction, while feuding its territory to Bonifacio Lupi. From that year onwards, the Venetian influence on the valley stopped, and Primiero entered the domains of the Counts of Tyrol. In 1373 the Hapsburgs – once become the rulers of Tyrol – recognized the rights allowed by Charles to Bonifacio, and the valley would definitely pass under a long period of Austrian rule. In 1401 the Duke of Austria gave Giorgio di Welsperg (from the Val Pusteria/Pustertal) the jurisdiction on Primiero; thus started the dinasty of the Welsperg Counts, which ruled over the valley for the next four centuries. Under the Welsperg dynasty, Primiero enjoyed a remarkable economic and demographic development; the town of Fiera was newly founded as a market town, and it soon became the main administrative and commercial centre of the region instead of Tonadico, while the economy of the valley took off thanks mainly to the mines of pyrite, iron and silver ('galena'). It is estimated that by the middle of the 15th century around 3000 miners, the majority of them of German origin, worked in Primiero. Commerce towards foreign countries grew also, in connection with the export of minerals and – above all – of timber, destined to eventually reach Venice after a long journey along the water courses (the Cismón and the Brenta). 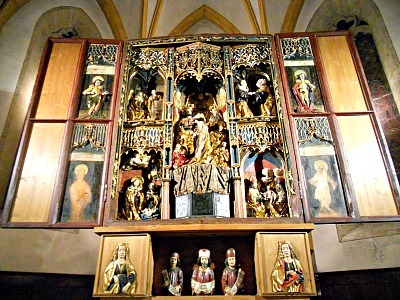 The mining activity lasted well until the end of the 16th century, when it was progressively abandoned (in the picture above, the Fluegelaltar of the main church in Fiera is a clear indication of the historic German presence in the area). Governed by the Welsperg family, Primiero then followed the destines of Austria until 1809, when it became part of the “Dipartimento della Piave” – the department instituted by Napoleon and coinciding roughly with the actual province of Belluno. Once annexed to the Napoleonic Kingdom of Italy, Primiero took part in the anti-French campaign led by Andreas Hofer with a small contingent of voluntary troops against Feltre. Participation to the armed insurrection led to heavy financial losses in the valley, and even to the arrest of the ‘borgomastro’ of Fiera, Michele Negrelli, father of the famous engineer Luigi Negrelli (who – unbeknown to most – engineered the Suez Canal). After the relatively short Napoleonic spell, ended in 1815, Primiero returned to Austria and became again a district of the County of Tyrol. During the second half of the 19th century the valley was interested by two very diverse phenomena: on one hand, a massive emigration, due to the definitive dismantling of the mines (in 1875 the last iron mines had been closed down); on the other hand, the arrival of the first excursionists and travelers – at this stage largely British – marked the very beginning and early development of tourism in the area. In the valley floor – and most notably in San Martino di Castrozza – the first hotels started to be built, even though the main activities for the local people remained agriculture and cattle farming, together with timber industry. Then, Primiero and the nearby valley of Vanoi – being traditionally borderlands – found themselves crossed by the frontline during WW1, and therefore in the middle of war events. The Austrians established their defense line by Passo Rolle, allowing the Italians to occupy the valley floor as early as 1915; in 1916, the Italian troops managed to get hold of the pass, while in the Vanoi valley they conquered Monte Cauriol. With the Italian defeat at Caporetto in 1917, however, Primiero was again conquered by the Austrians, who symbolically marched into Fiera. From this moment onwards, the war activities continued in other areas, while the conflict caused the evacuation of many towns and villages in both valleys. 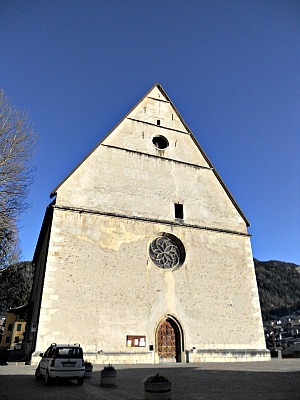 During the second half of the 15th century the Chiesa Arcipretale di Fiera was erected – one of the most notable Gothic churches in Trentino (see image above). It was built as an act of devotion by the numerous German-speaking community of miners (called canopi) present in the valley, and also with the economic contribution of the archduke Sigismund of Austria. Excavations in the presbytery have demonstrated the existence of three apses of pre-extant churches: two in Roman style (circa 1100-1200) and the most ancient of Early Christian origin. To the right of the Chiesa Arcipretale is the ancient Roman church of San Martino (11th century), now a Baptistery. 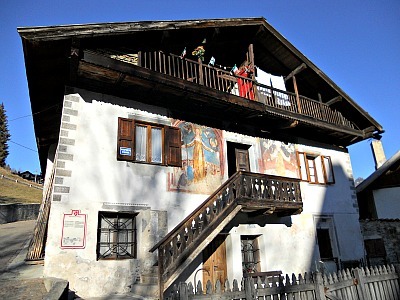 Besides this little church, the ancient ‘Canonica’ is a typical example of Primiero traditional house (see image below), adorned with frescoes and also with a notable lacunar ceiling ("a cassettoni") in the interior, dating to the beginning of the 16th century. In Rivetta Koch, facing the Chiesa Arcipretale was built the ‘Palazzo del Dazio’ or ‘delle Miniere’ – the ancient office for the collection of taxes, with mullioned windows ('bifore' in Italian), loopholes and also an ‘Erker’ – the typical angular Tyrolean bow-window. Above the 'bifora' that overarches the main entrance ('portone' in Italian) is portrayed the Hapsburg Eagle, which is among the 40 coats of arms of the families who once owned the mines. The building (pictured below) now hosts the “Museum of Material Culture” (‘Museo della Cultura Materiale di Primiero’). The other villages in the valley conserve buildings and houses in a more typically vernacular style. 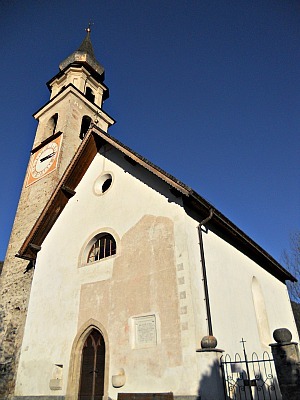 Each village still displays ancient frescoes; in the church at Mezzano, for instance, are portrayed two angels that bear a cross; according to an old legend, it is said that when an avalanche submerges the church, the end of the world will come. 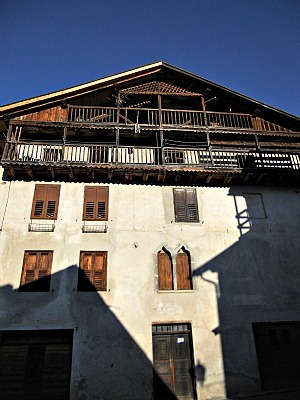 Other notable presences are the Venetian fountains (reminders of the time when the area was under the rule of the Serenissima) and other rustic buildings, such as the so-called ‘tabiadi’ (hay barns), often endowed with long external wooden balconies (piòli) cladding the main body of the building, used mainly for storing wood and drying hay. Worth mentioning are also some old notable ‘palazzi’, such as Palazzo Scopoli (XI century), ancient headquarters of the Counts’ vicar and now occupied by the Town Hall in Tonadico – the town which on the whole displays the most interesting historical centre in Primiero (see picture below); another noteworthy building in the same village is the small Church of San Vittore, with Medieval frescoes dating to the period of the Crusades; outside Tonadico, towards the beginning of the beautiful Val Canali, are the impressive ruins of Castel Pietra, one of the most important fortifications in the region during the Middle Ages. In Transacqua is instead the stately Palazzo Someda, dating to the end of the 16th century. The “Comunità di valle del Primiero” – an entity that in the administration of Trentino stands half way between the provincial government and the individual municipalities – is composed of 8 townships. The municipality of Canal San Bovo groups the villages and hamlets of the Vanoi Valley, while Sagron-Mis is in the Mis Valley. Along the main axis of the Cismon Valley are the other 6 municipalities, most of which form a small conurbation, divided into two smaller units: Imèr and Mezzano form one long linear settlement, while – divided from the former by a stretch of countryside – Siròr, Tonadico, Transacqua and Fiera di Primiero form the ‘central’ conurbation, and it is very hard to tell where one towns finishes and the other one begins. In all respects, Fiera is considered to be the main administrative centre; it certainly has a more 'urban' feel to it, but it is nevertheless quite small and compact, and part of its most notable buildings (namely, the Chiesa Arcipretale and the ‘Palazzo del Dazio’) are in fact within the municipal territory of Transacqua. As anticipated above, Tonadico used to be the main centre before Fiera, and that characteristic is retained in the many notable houses – mainly built in stone (which denoted wealth at the time) – that can be discovered when walking in the atmospheric alleyways; at the top of the hill is the Palazzo Scopoli, the town’s most notable building and high above the village is the church (pictured below). Mezzano is also a very interesting town, rich in old houses, but the difference in status can be told here by the fact that these houses are mostly built in vernacular style, thus betraying the more agricultural nature of the village, built on a small plain beside the river rather than on a hilltop. One of the most notable locations of Primiero is Castel Pietra, erected on a rocky crag outside Tonadico, and of which today only the ruins can be admired. It lies at the entrance of the beautifully wild Val Canali, which is one of the gateways into the Paneveggio Natural Park. The paths that open at the head of this valley will provide many hiking possibilities into the Pale di San Martino, whose towering peaks can already be seen from a distance – for example by the Park’s Visitor Centre of Villa Welsperg, in the Val Canali’s lower reaches (see the image below).